Over the past several weeks, I’ve been sharing a monogram alphabet for hand embroidery with you. I’ve dubbed it the “Delicate Spray” alphabet, and you can find the other letters in the alphabet listed on this page of free monogram patterns here on Needle ‘n Thread. Today, I’d like to show you a reader’s interpretation of this alphabet, to give you a good idea of how you can use traditional monogramming techniques to embroider the individual letters in the Delicate Spray alphabet. 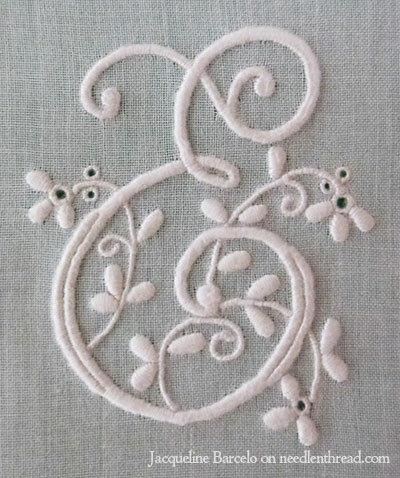 Jacqueline used the E from the Delicate Spray alphabet to embroider a beautiful monogram for her sister’s birthday. The finished letter is 60 mm high (about 2.3″). She embroidered it on white cotton muslin, which is mounted over a green sheet. For the embroidery, Jacqueline used an older skein of coton a broder #25, which she said was a little fuzzy due to the age. The embroidery is worked entirely in satin stitch. The stems are overcast stitch (satin stitch often worked over a small string or a thin split stitch line). Jacqueline split the thicker parts of the E into double lines of satin stitch. For the dots and the centers of the blossoms, she worked tiny eyelets. Perfect! This is a lovely example of traditional monogramming techniques! When you look at the photo, keep in mind that we are looking at it close-up. The finished monogram is just over 2″ high, so it’s quite delicate. If you’d like to embroidery any of the monograms from the Delicate Spray alphabet, you can find the alphabet (and a few other monogram alphabets) here. 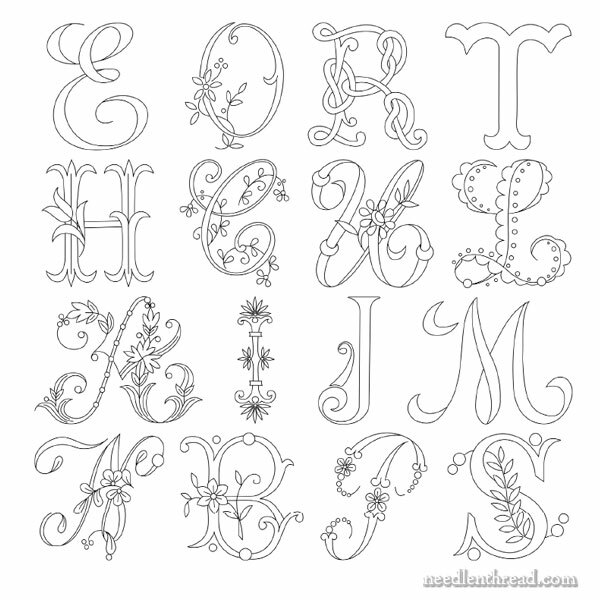 You’ll find this complete alphabet used above – along with 15 other decorative alphabets – all in one place in Favorite Monograms, a downloadable PDF collection of 16 monogram alphabets perfect for hand embroidery and other crafts. Beautiful work, Jacqueline. The letter is so tiny and delicate! Lovely! Congratulations Jacqueline, and thanks Mary, for the endless inspiration! Are you still accepting photos of work done by using something on the site? I’ve started Seed Stitching because of your article on filling stitches, and to my utter astonishment, I LOVE it for small spaces where a heavier stitch wouldn’t work. I’ve also Satin Stitched dots, using your article on that, and I’ve been steadily using two thread colors in a needle for shading thanks to the Secret Garden project. I hope to take pics soon, so I can send them. Thank you so very much for your generosity and this wonderful site! So delicate and beautifully executed! This will make a wonderful heirloom. Your sister is sure to love it. Beautiful embroidery. Clever idea for the thick part of the letter. I find too for the thick part and ,of course,beautiful embroidery,limpid, clear.Félicitations Jacqueline.And thank you Marie for the sharing. I wouldn’t have thought of splitting the space on two. Very nice! That is a very lovely and delicate piece of work, Jacqueline, and I am sure your sister will just adore it. I would. I was amazed when I read how small this piece actually is. What an incredible amount of detail in something so small! Previous Previous post: An Embroidered Casket – Celebrate this Finish! !